Buckingham cut the price target for Trinity Industries Inc (NYSE: TRN) from $32 to $26. Trinity Industries shares closed at $22.96 on Thursday. Canaccord Genuity lowered the price target for Biogen Inc (NASDAQ: BIIB) from $396 to $275. Biogen shares closed at $226.88 on Thursday. H.C. Wainwright cut the price target on Conatus Pharmaceuticals Inc (NASDAQ: CNAT) from $8 to $1.50. Conatus Pharmaceuticals shares closed at $2.91 on Thursday. Wedbush cut Booking Holdings Inc (NASDAQ: BKNG) price target from $2,000 to $1,850. Booking shares closed at $1,774.36 on Thursday. JP Morgan boosted the price target for Lumentum Holdings Inc (NASDAQ: LITE) from $50 to $65. Lumentum shares closed at $52.10 on Thursday. Citigroup lowered the price target for Biogen Inc (NASDAQ: BIIB) from $470 to $230. Biogen shares closed at $226.88 on Thursday. Wedbush raised the price target for Chipotle Mexican Grill, Inc. (NYSE: CMG) from $500 to $640. Chipotle shares closed at $670.45 on Thursday. Morgan Stanley raised the price target for Darden Restaurants, Inc. (NYSE: DRI) from $112 to $121. Darden shares closed at $116.11 on Thursday. Morgan Stanley boosted the price target for Cintas Corporation (NASDAQ: CTAS) from $163 to $172. Trinity shares closed at $208.12 on Thursday. Cowen lowered the price target for Tesla Inc (NASDAQ: TSLA) from $200 to $180. Tesla shares closed at $274.02 on Thursday. 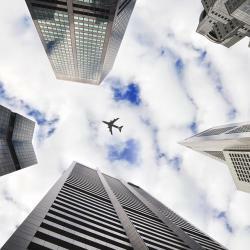 Transportation ETFs: Grounded Or Ready To Take Flight?